Week 5 of the College Football season treated bettors with a ton of points and a few notable upsets that has the AP-Top 25 looking fairly different from how it was pre-kickoff. The week started off with a major upset as No. 16 Washington State downed No. 5 USC by a score of 30-27. That result not only dropped the Trojans to No. 14 but also vaulted the Cougars up to No.11. The biggest winner of the day was Georgia, who shut out Tennessee 41-0 on the road. The Dawgs' currently occupy the fifth spot in the AP-25, which means they are on the College Football Playoff radar. The biggest loser of the day was LSU, who was upset at home by Troy, 24-21. Troy dominated the time of possession and won the turnover battle, so that result shouldn't come as a surprise to anyone. But enough about the entire college football landscape. I am writing this weekly piece to help bettors specialize in the Big Ten conference, and I will be breaking down every aspect of the upcoming Big Ten schedule and keep you in the loop with specific team situations. The Big Ten currently has four teams inside the Top 10, which is up from three the week before. Penn State still leads the Big Ten's cause at No. 4, with Michigan checking in at No. 7, Wisconsin at No. 9 and Ohio State at No. 10. Big Ten conference play got fully underway last weekend, and we were treated with a few solid games that were not only entertaining but profitable for those who tailed the free selections. Nebraska got the week started off by beating Illinois and covering the six-point spread. On Saturday, No. 4 Penn State and No. 10 Ohio State were big winners, combining to outscore their opponents 101-14. Both teams covered their respective spreads, and both games just squeaked "over" the posted total. Wisconsin was the other ranked team in action, and they held on to beat Northwestern 33-24, failing to cover the 16.5-point spread. And last but not least, Maryland defeated Minnesota by a score of 31-24 as 13.5-point underdogs, while Michigan State got the better of Iowa by a 17-10 score. The second exclusive week of Big Ten conference play gets underway this Saturday with two games set for noon eastern kick off. These games feature Illinois travelling to Iowa (-18) and No. 4 Penn State (-14.5) travelling to Evanston to take on the Northwestern Wildcats. The rest of the card looks like this; Minnesota at Purdue (-3.5), Maryland at No. 10 Ohio State (-31.5), Michigan State at No. 7 Michigan (-10) and No. 9 Wisconsin (-11.5) at Nebraska. Indiana is also in action, but they are taking on Charleston Southern, which is as good as having a bye week. Last week I gave you two picks that I was able to cash for you, so let's keep the momentum going into this week and cash two more. All odds are courtesy of 5Dimes. Before Minnesota took the field last week against Maryland, all the talk was about how legitimate the Gophers' 3-0 start was. Unfortunately for Gopher Nation, that was quickly dismissed after a very disappointing loss to the Terrapins. Minnesota was outgained in that game by more than 100 yards and failed to reach the 100-yard rushing mark, which is troubling considering they are a run-first team. 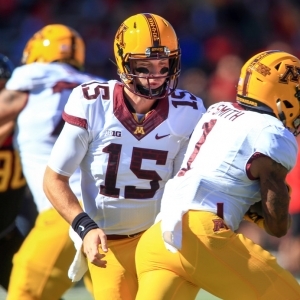 Not to mention, the Gophers allowed the Terps' third-string QB to carve them up. The Boilermakers one-two combo of Elijah Sindelar and David Blough should have a very productive day throwing the ball. That conference-opening loss doesn't completely rule out a chance for Minnesota to win the Big Ten West. However, with their upcoming schedule, it sure does put a lot of pressure on them to get a win this week against Purdue. I just don't see that happening, though. I am a big fan of what head coach Jeff Brohm is doing over in West Lafayette. He has turned the second biggest laughing-stock (Rutgers will always be first) into a team that has competed toe-to-toe with Lousiville and with Michigan (albeit for only the first 30 minutes) so far this season. The Boilermakers also come into this game off a bye week, which should help them in the injury department and get players close to 100 percent as possible. Those without injuries should be well rested and eager to make up for the dismal second-half performance (10 total yards) against the Wolverines. When the line came out, I expected it to be around 6.5. With the line set at just 3.5, I see value in playing the Boilermakers. It seems like just yesterday Michigan State was one of the best teams not only in the Big Ten but in all of college football. Unfortunately, a few rough seasons derailed that train, but I have been mightily impressed by their performances so far this season. The Spartans are 3-1 and have already beat two good teams in Western Michigan and Iowa. Their blowout loss to Notre Dame was unfortunate, but I think they used that loss to better themselves. The Spartans defense was able to hold Iowa's leading rusher, Akrum Wadley, to just 30 yards on 17 carries. He might be the second-best running back in the Big Ten, so that feat should not go unnoticed. Michigan doesn't exactly have a run game that will blow you away, so I think the Spartans defense can get a few key third-down stops and get the ball back for their offense. Offensively, the Spartans will rely on QB Brian Lewerke to continue to make good decisions with the football. Lewerke performed well last week against Iowa, completing 18-of-28 passes for 212 and two touchdowns. The biggest thing in that stat line is that there were no turnovers, something that has plagued the signal caller so far this season. In terms of the Wolverines, we all know how solid they are defensively. Their defense alone has the ability to score points and win games for them, just like we saw two weeks ago against Purdue. The biggest problem with Michigan is their offense. They have struggled to find any semblance of a rhythm and must now rely on their backup QB, John O'Korn. O'Korn is replacing Wilton Speight after he suffered a "soft tissue injury". The promotion of O'Korn shouldn't instil any more confidence that the Wolverines offense can start producing. I believe 10.5-points is too many to lay with the Wolverines in this particular spot. This game should be a low-scoring affair, which means points will be at a premium. Take the underdog.